Loblolly Rise is a quiet, secluded property nestled in the trees. 45 acres completely surrounded by Mandalay Plantation provides many backdrops for a beautiful ceremony and reception. We are a family owned, premiere wedding venue, and special event venue. Located directly off Thomasville Road (319/Plantation Parkway) 1 mile past the Georgia/Florida line on the Georgia side. Check out our amenities below and click here for our FAQ section. Exclusive use of the property from 9am – 11pm, only one wedding per day. Additional hours can be added if needed. Fire place inside the barn for those few cool/cold evenings. Heaters available for rent. Barn can be used as a Rehearsal dinner option. Email for pricing. A beautiful pond near both ceremony and reception sites. 10 white farm tables with bench seating. Tables are 6 feet long, 34" in width and can seat 6 people at each table. 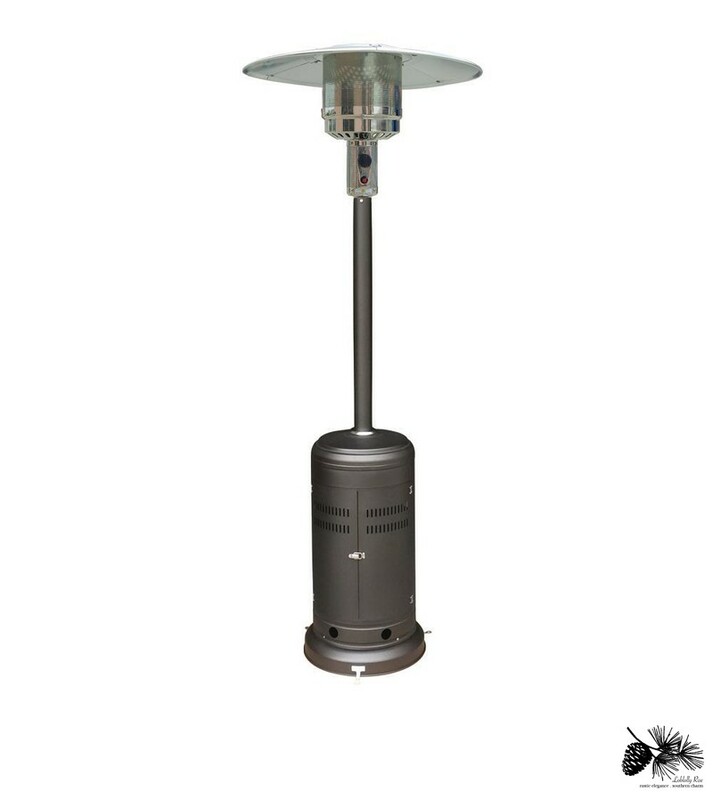 Patio Heaters: Our Heaters make your event comfortable when it gets chilly outside. Pricing: $60 for each heater with propane tank. Please allow 3 to 4 days notice so that we can fill the propane tanks. This item isn't something you need to commit to until the week of your event/wedding so you can watch the weather forecast. No delivery charge or setup charge since they will already be at Loblolly. We have 8 total. This is your special day. We understand that you want it to be perfect. To ensure that you have the best event possible, we work with professional planners and vendors who concentrate on the details so you can relax and enjoy your occasion. We also give you exclusive use of the property to celebrate your once-in-a-lifetime event. The barn is a white-gray wash in color. Over 5,000 square feet in the main area. Chandelier lighting, drapes on the beams, fireplace, concrete flooring throughout. The stage has enough power for an 8 to 10 piece band. The back addition of the barn includes a kitchen, a groom room, and two restrooms. You may schedule bridal and/or engagement photo sessions on the property if you have scheduled the venue for your event. The property has abundant beautiful features. You are welcome to roam the property. Just contact us to schedule the property for a photo shoot. If you do not have an event scheduled here, please have your photographer contact us to discuss using the location for photo shoots. You are welcome to bring beverages to serve your guests. We have an air conditioned kitchen located in the back left corner of the barn. You can access the kitchen from the back of the barn and also from the main area of the barn. Please park behind the barn. We have a refrigerator, oven, microwave, sink, and stove. The kitchen is for final preparations and warming, not necessarily for cooking all day. There's also an ice machine and an outdoor sink area. You will need to obtain event insurance which an easy process. Your rate will depend on your wedding details...two major details that give you a higher rate are alcohol and number of wedding guest. When selecting Alcohol Coverage be sure to mention or click Host Liquor, NOT retail. Check with EventHelper.com or Wedsafe.com. Also, check with your car insurance place or homeowner's....usually if you already are an existing customer then they will give you a discount on other services. This is something you can “shop” so you can get the best coverage for the best rate. $1,000,000 minimum is required. Starting pricing is around $80. We have a list of vendors we can suggest, however you aren't required to use anyone on that list...it's just suggestions. Outside vendors are more than welcome at Loblolly Rise. There are two air conditioned restrooms, men's and women's. Both located in the back right corner of the barn. The women's has two stalls, the men's has one stall and an urinal. There is a separate air conditioned cabin for the bride to get ready. A open white rustic area completed with white shabby chic decor, mirrors, living area, king size bed, farm table, full bathroom, and kitchen. 14x18 air conditioned room located on the back of the barn for the groom and groomsmen to get ready. Leather couch, mirrors, hooks for hanging clothes, and more. Clients and vendors are responsible for clean-up. All vendors must be out and cleaned up the night of the event unless already pre-approved by Loblolly Rise. Please check the blog for openings....click Here or Commissioned Dates. Contact us for pricing and to schedule a tour.